The engine starts by pressing the push button start while depressing the clutch pedal (manual transaxle) or the brake pedal (automatic transaxle). To switch the ignition position, press the push button start without depressing the pedal. Do not leave the ignition switched ON while the engine is not running. Doing so could result in the battery going dead. If the ignition is left in ACC (For automatic transaxle, the selector lever is in the P position, and the ignition is in ACC), the ignition switches off automatically after about 25 minutes. The power supply to electrical devices turns off and the push button start indicator light (amber) also turns off. In this position the steering wheel is locked. Before leaving the driver's seat, always switch the ignition off, set the parking brake, and make sure the selector lever is in P (automatic transaxle) or in 1st gear or R (manual transaxle): Leaving the driver's seat without switching the ignition off, setting the parking brake, and shifting the selector lever to P (automatic transaxle) or to 1st gear or R (manual transaxle) is dangerous. Unexpected vehicle movement could occur which could result in an accident. 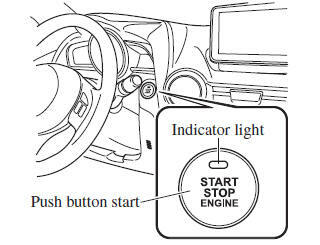 (Locked steering wheel) If the push button start indicator light (green) is fl ashing and the beep sound is heard, this indicates that the steering wheel is not unlocked. To unlock the steering wheel, press the push button start while moving the steering wheel left and right. In this position the steering wheel is unlocked. This is the normal running position after the engine is started. The indicator light (amber) turns off. (The indicator light (amber) illuminates when the ignition is switched ON and the engine is not running.) Some indicator lights/warning lights should be inspected before the engine is started (page 4-37 ). (SKYACTIV-G 1.3, SKYACTIV-G 1.5) When the push button start is pressed to ON, the sound of the fuel pump motor operating near the fuel tank can be heard. This does not indicate an abnormality.